Have you noticed? Wood fired pizza ovens are all the rage. You can’t visit a friend’s house without hearing about how Carl and Jen just installed a new wood fired pizza oven and that’s all they’ve been cooking with for weeks! But just what do you want with one of these ovens? How often do you even eat pizza, anyway? Once a week, max? As we’re about to find out, these ovens can be used for cooking pretty much anything – and you don’t need to be a fan of pizza to participate. Get your fish roaring to crispy-skinned perfection with your wooden pizza oven! You will need to place your fish in a dish before placing in the fire so that the juices don’t escape into the inside of the oven, or place the fish in foil instead. You can also fit a much bigger fish in your wood fired pizza oven than you can in your regular oven, plus it’s ready in no time. Let’s be honest – unless your household is gluten free, there’s always a loaf of bread kicking around somewhere! But rather than get the cheap and nasty stuff from your local supermarket, you can use your wood fired oven to make your own bread instead. If you’re not really into the whole knead, wait, knead thing, then there a ton of no knead bread recipes out there too. Load up your oven and you’re set for the week. Roasted veggies taste oh-so-delicious when done in the wood fired oven. For the best results, use root vegetables and par cook them before putting them into a tray into the oven with some oil and balsamic and cooking for about 20 minutes. Crispy vegetable delight is what that is. If you love slow cooked meats – and let’s face it, who doesn’t, unless they’re a vegetarian? – then you’ll love slow cooked meats in your wood fired pizza oven. Roast meats for around 4 hours until they’re just falling off the bone. Too delicious and too easy! This list wouldn’t be complete without, of course, pizza! Fans of gourmet pizzas will be in for a treat with their own wood fired pizza oven. Not only can you tweak your dough recipe to be thin and crispy or just a little bit more thick, you can experiment with all sorts of toppings. Potato, rocket, and rosemary? Quattro formaggi? Tandoori chicken? It’s up to you. This isn’t all you can cook in there either. Think stews, casseroles, and soups, and anything else your heart desires! 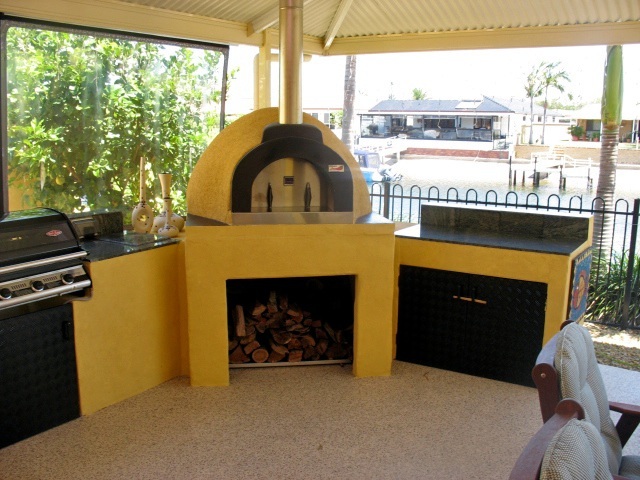 View our range of wood fired pizza ovens at Sydney Heaters & Pizza Ovens and start dreaming up what you’re going to cook in your very own.